Immigrant-rights agitators dissemble and deceive about “caravan” invaders, calling them asylum-seeking families fleeing violence back home, but the Trump administration has said those cases are a small minority within the 8,000 to 10,000 migrants. And the majority are men, young fit, and military age. Homeland Security said Friday that a convicted murderer was among the members of the migrant caravan, and was caught trying to sneak into the U.S. late last week. Until four months ago Miguel Angel Ramirez, 46, was in a Honduran prison serving time for murder, authorities said. 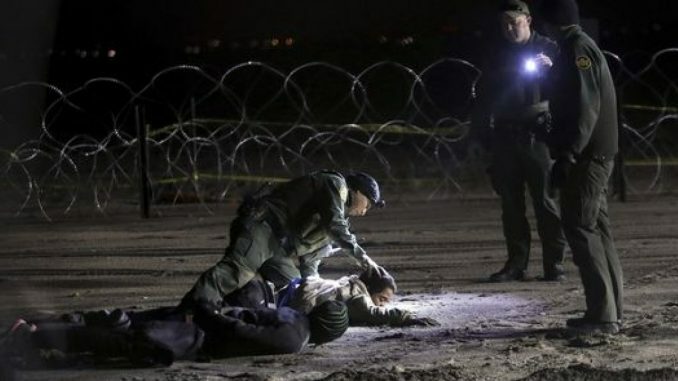 On Saturday he was nabbed near the San Ysidro border crossing along with two other Honduran illegal immigrants, having just crossed without permission. Mr. Ramirez told agents he’d traveled with the migrant caravan that has seen thousands of people from Honduras bust into Guatemala, then Mexico, and arrive at the U.S.-Mexico border plotting their entry. While immigrant-rights advocates have called the caravan members asylum-seeking families fleeing violence back home, the Trump administration has said those cases are a small minority within the 8,000 to 10,000 migrants. Homeland Security says it has identified 600 identified criminals within the caravan. “The fact that Border Patrol arrested a murderer within the first caravan-related apprehensions at our southern border proves how real the threat of the caravan is to our national security and public safety,” said department spokesman Tyler Q. Houlton. A self-admitted MS-13 gang member also traveling with the caravan was arrested Saturday. Homeland Security said he and the two men he was caught with are being processed for deportation.